I want to grow produce that I can sell. I’ve decided to try grapes. Or maybe I want to have a good reason for my desire to grow grapes. I bought some Concord starts. 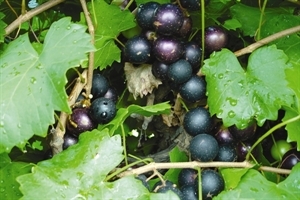 This is the grape that is made into the well-known purple grape jelly and juice. It’s also a table grape. Concord is my favorite kind of grape. It has such a unique flavor. Some grapes have only female flowers while others have both male and female parts. This means that I need to make sure that I plant accordingly. I’ve ordered 6 Jumbo muscadine starts. BTW, this pic and the next come from Bottom Nursery’s website. Jumbo muscadines are female only, so I’ve also ordered 4 Cowart Muscadine starts. 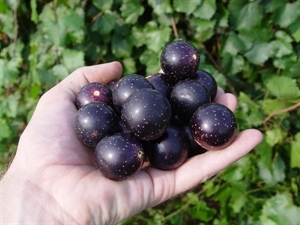 Both types are very dark grapes, though muscadines can also be bronze. Grapes generally take 3 years to begin producing. You can order 1 or 2 year starts. I’m an absolute novice at ordering these. My experience with grapes is restricted to saving an old vine, making juice and eating grapes. I’m going to plant on the slope, which means I have some terracing to do. I also need to build a trellis. I ordered the muscadines as bare root. This means there’s no soil with them. Many people don’t recommend this. I’ll let you know how it goes. This entry was posted in Plants, Shrubs and Trees and tagged concord, cowart, grapes, jumbo, muscadine by admin. Bookmark the permalink.